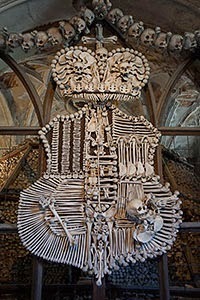 Sedlec Ossuary, also known as the Bone Church, is a underground Roman Catholic chapel located in Kutná Hora, Czech Republic. It is actually located underneath the Church of All Saints and contains the bones of about 40,000 people who died from the plague and the Hussite wars in the 15th century. Originally, all of these bones were buried in the church cemetery, but throughout the years starting in 1511, the bones were arranged to be part of the chapel. The present arrangement dates back to 1870, when František Rint of Česká Skalice, a Czech wood-carver, was asked to arrange the bones and skulls as you see today in creative decorations such as bells, a coat of arms and a chandelier. You can actually see his name, in bones, on the right-hand wall over the last bench. 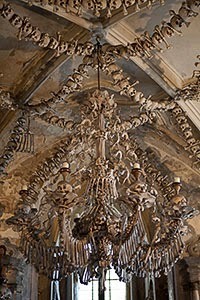 Fun fact, the chandelier contains all the bones of a human body. It costs 80 CZK for admission to both the Cathedral and the Church. From Prague, it is about 120km, easily accessible by car, by train, or even by bus. Come back next Monday for another Future Point of Interest.